You will never die. Beyond the mortal boundaries of your physical form, you are an immortal being, living forever in a beauteous, radiant body of luminous spheres in multiple dimensions. 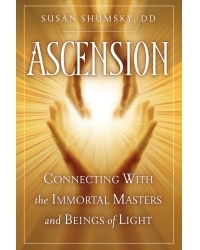 Ascension: Connecting With the Immortal Masters and Beings of Light will open your eyes to these spheres. You will begin to awaken your true, immortal self—a magnificent being of brilliant light, radiance, and glory. Ascension leads you into the depths of your being to recover what might be called your higher self, guardian angel, inner guru, spiritual guide, master-teacher, or God within. You will meet and consciously communicate with deities, angels, archangels, and masters from worldwide traditions, as well as with divine beings personal and unique to you. All of them are eager to meet and communicate with you. • How to meet the ascended masters and angels of light. • Stories, beautiful paintings, and drawings of these immortal beings. • What it means to experience ascension and walk beyond death. • Stories about visitations from divine beings. • People living today who might be ascended masters. • Inspiring messages from the immortal masters and deities. Susan Shumsky, DD, is the author of Exploring Auras, How to Hear the Voice of God, Exploring Chakras, and other well-known titles. She appears regularly in the media and has been featured in Woman’s World, Cosmopolitan, and GQ. Dr. Shumsky has practiced self-development disciplines for more than 40 years. For 22 years she was the student and personal assistant to the Maharishi Mahesh Yogi, founder of Transcendental Meditation and guru of the Beatles. She then studied New Thought and metaphysics for another 20 years. Dr. Shumsky has taught thousands worldwide to meditate, develop their intuition, and attain self-realization and enlightenment.